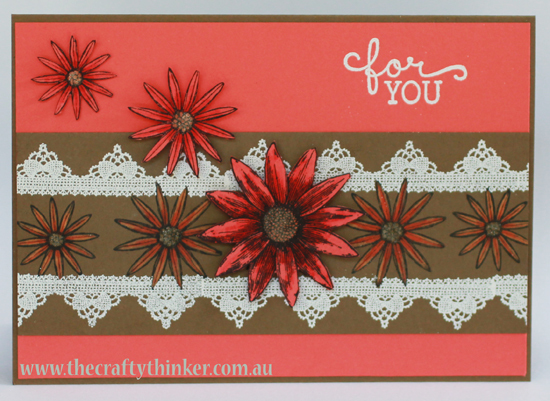 This card will be featured in the Crazy Crafters' Team Project Highlights from 6.30 pm on 1st April, so do visit (by clicking on the little image to the left) and vote for your favourite projects. I have long been a fan of the bleaching technique and had also decided that I should make more use of my Grateful Bunch set so it was almost inevitable that I would combine the two! Dimensionals give a little bit of ..... dimension! The various pieces of this card have been sitting on my table for a couple of weeks, waiting for inspiration to strike. In the end, I had to call "time" and do something with them! A simply card but I think it's elegantly cheerful! I started with line of flowers on the Soft Suede cardstock. It was always my intention to bleach them, so clearly my head was not together when I stamped them with Archival ink instead of heat embossing them in black! They actually came out better than I expected - I was worried that the black ink would completely bleach away. I coloured those flowers with Calypso Coral ink (the yellow is simply the bleached cardstock). Then I masked the flowers while I added the white heat embossed lace elements. The Wink of Stella is so pretty! 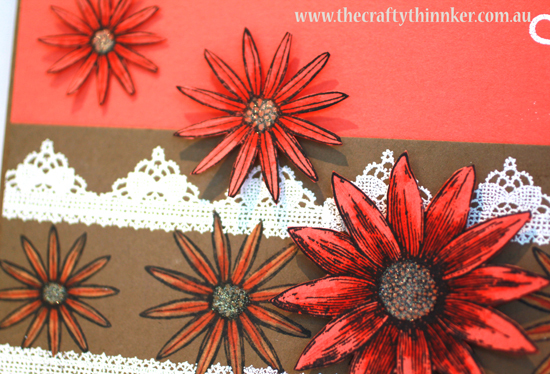 Then I stamped three flowers with Basic Black ink onto Calypso Coral cardstock. I elected to hand cut them rather than use the matching punch because I wanted them to be cut close to the lines. I shaded them with Watermelon Wonder ink. 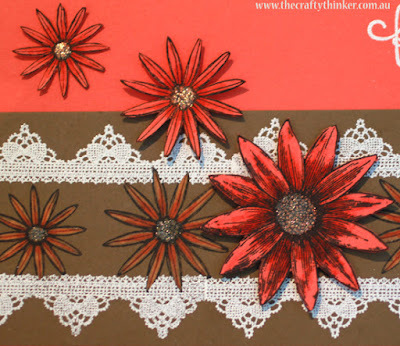 I layered the bleached floral band onto Calypso Coral cardstock and then onto a Soft Suede card. I added a greeting from Birthday Blossoms (heat embossed in white) and adhered the three flowers - two of them with Dimensionals and the smallest with a glue dot. Lastly, I added gold Wink of Stella to the centres of the flowers. To make a purchase, click on a product image below.